Does your dog have poop issues? 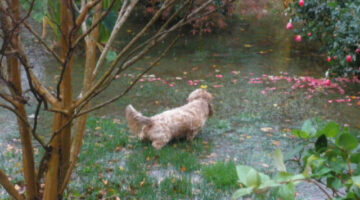 Are you tired of standing in the rain waiting for your dog to do his business outside? Try training your dog or poop on command. Here you'll find the best ways to train your dog to poop outside and our picks for the best accessories for cleaning up after your pet. The usual simple steps to crate training are practical and helpful — but they overlook the day-to-day troubles that you’re likely to face in the process of crate training a dog. Here are some important things I’ve learned about crate training dogs. I did it differently with my first dog (a Labrador) than I did with my second dog (a French Bulldog). See the 10 mistakes I’ve done when crate training dogs — and how to avoid making those same mistakes. 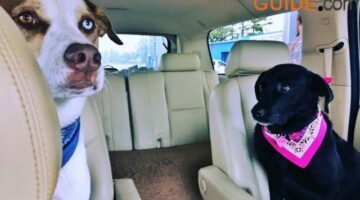 Dog Travel Tips + Clever Dog Car Accessories You Might Not Think Of! I have 2 large dogs and they pretty much go wherever I go! I’ve whittled down my list of dog travel necessities to 7 dog car safety items and 7 clever dog travel accessories — the most important things to pack for dog car travel, plus a few clever dog car accessories that you probably haven’t thought of. These are the items that we take along whenever we’re traveling with our dogs in the car. Perhaps you’ll find them useful as well! See why I think Beau’s Dream Dog Park at Buchanan Park is the best off leash dog park in Lancaster PA. If you’ve never been, you’re missing out! These are my must-know tips for enjoying this beautiful dog park — and what you can expect before you go to this Beneful dog park for the first time. Dealing with a bad case of dog diarrhea? I used to work at a vet. While there, I learned a few home remedies for dog diarrhea. Diarrhea in dogs can be serious. See which dog diarrhea treatment works best for my dog, and when you should see a vet for doggie diarrhea. How To Get Answers To Your Dog Health Questions… Fast! Get answers to your dog questions right away — online — from verified pet experts. What’s your dog question? It’s not always so easy to find out what’s causing diarrhea in dogs. Here are the top reasons a dog has diarrhea. Tired of standing in the rain waiting for your dog to do his business outside? Try training your dog to pee or poop on command. All you need is a ‘cue word’, some dog treats, and a little bit of patience. If your dog just started to go potty inside your house, you first need to find a pattern to your dog’s peeing and pooping inside the house. Then use the following housebreaking tips to put an end to ‘accidents’ inside the house once and for all! Does your dog have diarrhea? If so, there is a great dog diarrhea treatment you can try at home that will help. It simply involves giving your dog a bland diet and some human anti-diarrhea medicines that are safe for dogs. Looking to potty train your puppy? Here are some tips. Plus an idea that most people would not even think of. It can sometimes be more difficult to train an older dog not to pee or poop in the house. Here are 5 important points to consider when housebreaking an older dog — including how to housebreak a dog when you’re busy and away from home a lot. Here’s a little about our dog’s recovery from TPLO surgery for a torn ACL, as well as the stories of other dogs who’ve been through it. Plus the stories of other dogs who’ve had TPLO surgery, including their recovery highlights. I Found The Best Dog Poop Bags & Dog Poop Bag Holder… Finally! Got a dog? Then you need to find some dog waste bags and a dog poop bag holder or dispenser that you like. The bags… I’m not so particular about. That’s the easy part. But finding a dog poop bag holder that you like… now that’s a whole different story. I found it! 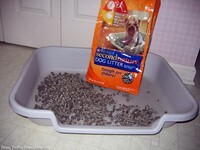 Fun Tip For Potty Training Puppies: Try A Dog Litter Box! If you have a new puppy and won’t be able to take him out to pee and poop often enough, consider a dog litter box to help make housetraining easier. Our 2 Beagle pups love the doggie litter box. It definitely made housebreaking a smoother process in our home! Did you know that you don’t always have to take your dog to the vet in order to get a veterinarian’s diagnosis — and maybe even meds — for your dog’s minor health issues? It’s true. With any non-emergency doggie ailment, you generally have 3 options. If your dog is showing a particular symptom or dealing with a doggie ailment, then anything you can show the vet that might be related to ‘the problem’ will usually be helpful when it comes to diagnosing and/or treating your pet. Here’s when you should take samples to the vet… what type of samples to take… and how to gather & transport your samples — like dog pee or poop. Check out these funny videos of dogs scooting their butts on the carpet. Hey, it’s only natural! Bill Clinton Has Gone To The Dogs! With all this talk about Bill Clinton lately, I figured there’d be some humorous way to relate this to dogs. Alas, I think I’ve found it! Take one former president, one dog, an ‘interesting’ prop… and what do you get? Another popular thing that people do with dog poo is Recycle it! Here are instructions to build your own doggie waste compost for use in your backyard. Need some reasons to pick up poop? Here’s a whole list of health reasons & why it’s important to pick up your dog’s poop! Plus, tips that make picking up dog poop even easier. Dog Poop Signs: Get One For Your Yard! Here’s how to politely inform your neighbors that you’d like your yard to remain poop-free… Check out these affordable poop signs that you can place in your yard. Plus, some great tips to help keep your yard — and neighborhood — poop-free! What the?… I’m sure this would be a harmless fun prank for some people, but I’d be very careful in choosing who you send this dog-friendly gift to!